Loaded with intricate spices, shimmering and earthy flavors, Indian cuisine is as good as cooking gets. 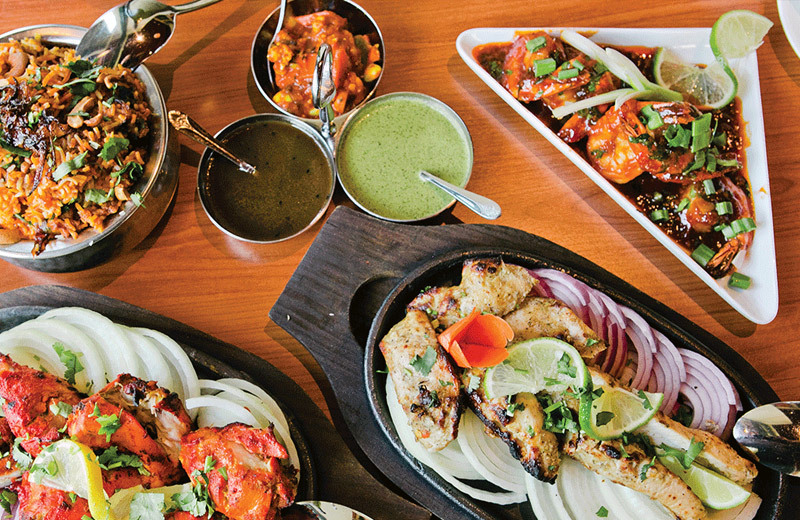 Foods from the northern Indian Punjab provide stand-out memories of the Ambrosia Indian Bistro newly opened in Scotts Valley. Our senses were undeniably expanded after a meal here, and the reason is spice! Ginger, garlic, coriander, cayenne pepper, and garam masala (itself a spice blend combining cardamom, cumin, cloves, cinnamon and black pepper). Most of Ambrosia’s curry dishes, chutneys, and savory sauces offered a blend of some—or all!—of these. Last week, craving the flavor high that only Indian food can deliver, we checked out the newest Ambrosia, located across the street from the Hilton Hotel, right off Highway 17. The modern and welcoming interior has been smartly inflected with traditional carved and embroidered crafts and fantastic aromas. Attired in crisp black uniforms, the helpful and attentive staff brought water, a basket of feather-light, paper-thin papadums, and a tray of chutneys almost immediately after we were seated. At this point, I want to remind readers that I timed our drive from the Westside of Santa Cruz to the Ambrosia parking lot at exactly 10 minutes. Crunching away on those gossamer papadums—lentil crackers—we sampled the green mint chutney, the delicious, slightly sweet tamarind chutney, and the house pickle involving lots of red pepper, garlic, carrots, and tiny cauliflower florets. We immediately ordered a second helping of the house pickle, a condiment so vivacious that it could amplify and distinguish almost anything edible. Stupendously spicy, this relish came in handy later in the meal as an adornment for the lavish Tandoori Mixed Grill ($23) that formed the centerpiece of our dinner. A festival for our tastebuds had already begun. To augment the traditional clay-oven bouquet of tandoori chicken, shrimp and lamb sausage, we ordered another curry of lamb ($16), sauced in fresh coconut cream and green peppercorns. And my always favorite vegetable curry, Aloo Gobi ($10), showcasing what a finely spiced sauce can do for potatoes and cauliflower. I enjoyed my glass of Estancia Sauvignon Blanc ($7) and my companion his St. Pauli Girl ($4.50) as we munched ourselves senseless over the spice pyrotechnics of the fiery house pickle chutney. Then the main dishes arrived, smartly served with obvious pride and flair. Covering every inch of our table were tureens of steaming curries, one with fat chunks of aromatic lamb, the other loaded with spiced veggies. The centerpiece was a sizzling iron platter piled high with huge chunks of colorful chicken (red from tandoori chili powder), shrimp and plump lamb sausages, on a bed of onions. I added some of the pickle to the chicken, and quickly discovered that I liked the beautifully seasoned, finely textured sausage the best. But it was the showcase Aloo Gobi that stole our hearts. Fiery with red and black peppers and cinnamon, coriander, garlic, and cloves, the curry was nothing short of brilliant. Let me confess—Ambrosia’s kitchen had produced the best Aloo Gobi I’ve ever tasted anywhere, including London, New York, and San Francisco. Perhaps the lamb curry could have been a bit bolder for my taste (no worries, I simply added a few hits of chutney), but joined by brown rice, everything was wonderful. We took most of our generous portions home for lunch the next day, vowing to work our way through Ambrosia’s entire, mouthwatering menu. SCOTTS VALLEY >> I’m a confirmed omnivore. But I have a number of vegetarian and vegan friends, and all of them seem to be fans of Indian food. My vegetarian friend Rachael was eager to join me for dinner recently at Scotts Valley’s new Ambrosia India Bistro — and she was delighted to find the restaurant offers a whole vegan section on its main menu offering appetizers, soup, salad, three types of bread, two desserts and a dozen vegan entrees. 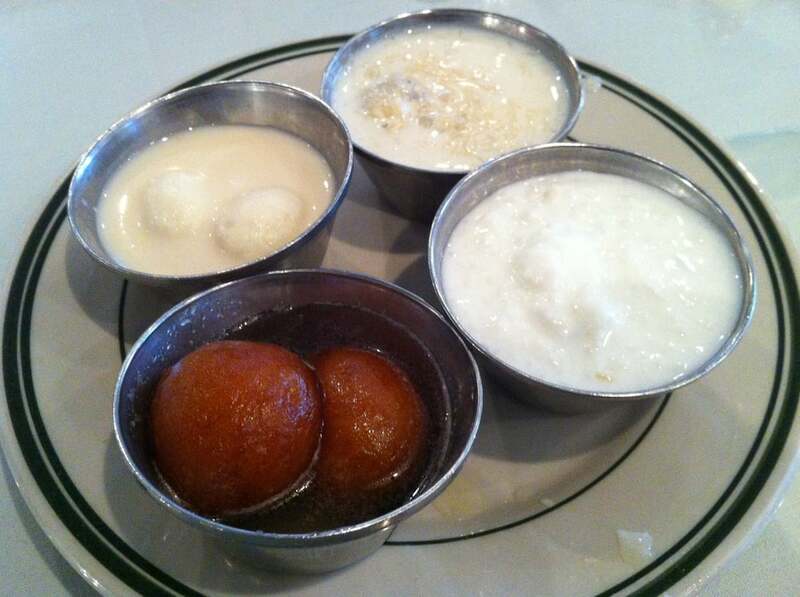 The Scotts Valley venue, just off Mount Hermon Road on La Madrona Drive, is one of four Ambrosia India Bistros; the original restaurant was opened in Monterey in 2006, followed by a sister venue in Aptos and a cafe on Cannery Row. As the impeccably dressed host led us to a table next to a wall-high window, I noticed the servers wore ties and classic all-black with short black aprons. We commented on the relaxed, tastefully refined decor, from dark slate-tile floors and handsome ethnic artwork to lighting that was warm yet effective. Our waiter brought complimentary papadum along with mint-coriander sauce, house-pickled spiced vegetables and tamarind sauce; the very thin, crisp lentil wafers brought out the savory aspects of each relish. When a nearby table received one of Ambrosia’s “Tandoori Sizzler” menu items, however, it became hard to appreciate the delicate flavors of our food because the sizzling dish created so much smoke. I’m not a fan of fajitas for the same reason: Although they may be delicious, these smoky dishes often dominate the restaurant atmosphere. We ordered the Assorted Vegan Platter Starter ($7) to share and Rachael chose the Vegan Tofu Tikka ($12) entrée; I decided on the Goa Fish Curry ($17). Our dishes weren’t particularly quick to arrive but the servers brought more sauces and yummy papadum to enjoy with light, crisp, King Fisher ($5.50) Indian ale. The beverage list featured a number of wines, including several local vintages, with prices ranging from the house wine at $5.50 a glass to $269 for a bottle of Dom Perignon. The pakoras on our Vegan Platter — savory, crisply fried, mixed-vegetable fritters — were standouts, and particularly good with the tamarind sauce, although we found the tandoori bharwa aloo (stuffed potatoes) and triangular samosa a little under-seasoned. Our platter also came with a simple salad and papadum studded with cumin seeds that added pops of spice. We both enjoyed Rachael’s choice, the Vegan Tofu Tikka, which was served very hot — but not smoking — on a cast iron tray supported by a wooden platter. The generous bed of wonderfully sweet, thin-sliced onion was covered with a rich, spicy, tomato-based sauce enveloping thick triangles of tender baked tofu. I actually preferred the vegan entrée to my fish curry. Although the mild, firm fish was perfectly cooked, it competed with the rather heavy, coconut milk-based sauce. This dish offered some interesting flavors but they were more muddled than distinctive. A few days later, I returned to Ambrosia with my friend Laurie to try the lunch buffet. 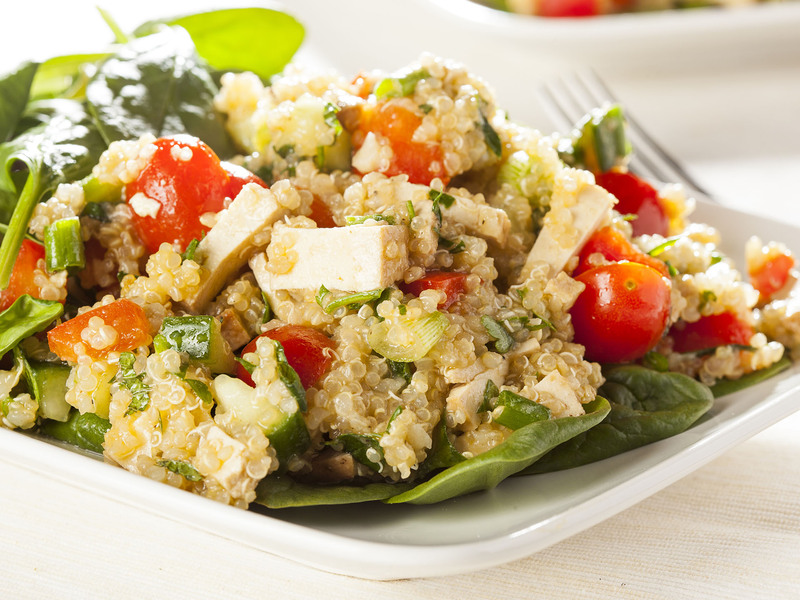 Walking in the door, we immediately smelled the exotic, enticing aromas of Indian spices — and no sizzling oil. We sat in the restaurant’s second dining area, where a row of metal chafing dishes, plates and bowls were set out on a long side table. The handsome décor included a wall of heavily embroidered framed tapestries from India. Our charming Nepalese waiter, Raj, provided efficient and responsive service throughout the meal, even though Laurie and I both chose the serve-yourself Lunch Buffet ($10.95). We also were impressed that staff members were continuously replenishing the chafing dishes and and tidying the buffet area. And what a buffet! Fresh fruit, mixed greens and a cornucopia of sliced vegetables led the offerings, followed by nicely cooked tandoori vegetables. Chutney and sauces provided color and equally bright flavors: mint-mango, mint-coriander and tamarind sauces, house-pickled vegetable chutney, raita and a chunky red chili sauce. Wonderful vehicles for our hot buttered naan and papadum. The nine covered chafing dishes revealed several vegetarian items including basmati rice, baby eggplant, dahl makhani, delicious spinach pakoras and a tasty curry filled with plump mushrooms and green peas. I was smitten with the three chicken dishes: a delightful heat-infused chicken curry, sumptuous butter chicken bathed in creamy tomato sauce and very tender, red-tinged tandoori chicken thighs and drumsticks. My least favorite items were the somewhat bland dahl and the dessert, an oddly textured semolina pudding. Located in a brand-new space, Ambrosia India Bistro is beautifully appointed and offers a comfortable combination of refined and casual appeal in a hospitable atmosphere. It also has one of the best lunch buffets I’ve tried in a while, both because of its variety and the freshness of the dishes. My advice: Go hungry. Hours: Lunch buffet 11:30 a.m. to 2:30 p.m. Monday through Friday, weekend brunch 11:30 a.m. to 2:30 p.m. Saturday and Sunday; dinner 5-9:30 daily. Happy hour 5-6:30 p.m. daily. 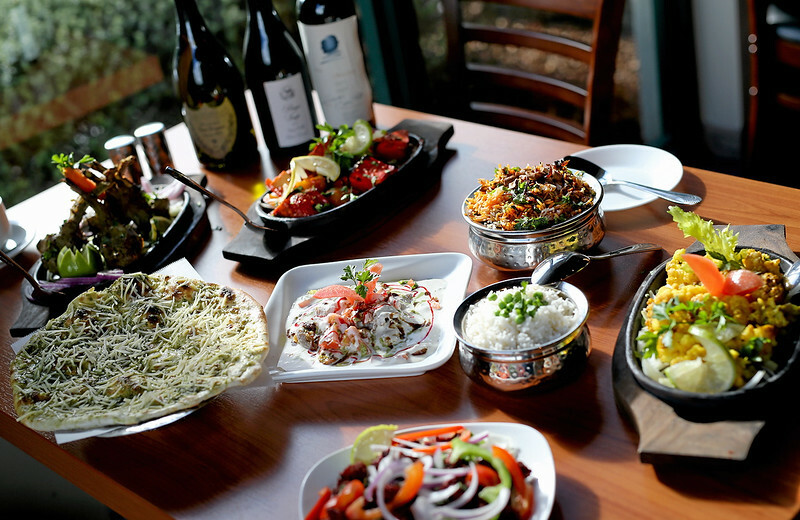 Sam Khanal opened the first Ambrosia India Bistro in Monterey in 2007 with co-owner and chef Bhupender Singh, followed by an Aptos location the following year. Khanal has gone on to open two more Ambrosia restaurants alone: a cafe on Cannery Row and the Scotts Valley venue. He points out that the brand new space is decorated with a number of items imported specially from India including a large, intricate bas-relief carving made from a single piece of wood. The rustic, classically Indian elements are balanced by modern architectural lines and a gleaming granite bar. That staff includes Ambrosia India Bistro’s chef, Kapil Dhakal. Our genial lunch buffet waiter, Raj, formerly worked at the Monterey restaurant. One of Ambrosia’s most popular menu items, says Khanal, is the Lasooni Saag Paneer, a traditional dish made with spinach, Indian cheese and garlic. The customer response and support has been ‘tremendous’ since the Scotts Valley restaurant opened Nov. 1, says Khanal.